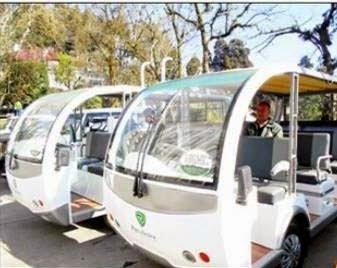 Darjeeling people felt unhappy as the Gorkhaland Territorial Administration (GTA) spending Rs 35 Lakhs to buy and run these hideous contraptions or the battery operated Electric cars around Darjeeling Mall road. Apparently this is supposed to help the tourist and locals stroll mall in an environmental friendly way, as these are battery run vehicles - also popularly known as e-rickshaws or electric carts. The tranquility of mall road is maintained as no vehicle runs there... with the introduction of these vehicles, we feel that it will ruin the whole essence of Mall road. These vehicles will be great if they run from near Bhanu Bhawan to Zoo, but definitely not around Mall road. According to sources each of these vehicles cost around 1.5 Lakh, and by that account, around 20 of these vehicles will be introduced in Mall area by the upcoming tourist season. While many may think of this as a great idea, here at TheDC we think it will ruin the tranquility of our beloved Mall Road and Chowrasta. Apparently, the GTA is looking to hire women drivers fluent in English, Hindi and other languages to run these vehicles, which is a welcome thing. But please NOT AROUND MALL ROAD... take them to Zoo, Shrubbery Park and Ropeway... spare our Chowrasta and Mall Road .